The Lady (Director: Luc Besson): Director Luc Besson steps out of his comfort zone with The Lady, a biopic about Aung San Suu Kyi, the Burmese politician who spent almost 15 years under house arrest in her family compound for leading a democratic uprising that opposed Burma’s oppressive and corrupt government. Best known for high energy movies like La Femme Nikita, The Fifth Element, and Leon: The Professional, Besson reins in the action for this expansive drama, which surprisingly focusses as much (if not more) on Suu Kyi’s relationship with her family as on her political history. In performances sure to generate Oscar buzz, Michelle Yeoh plays the titular character and David Thewlis plays her husband Michael Aris, a professor of Tibetan and Himalayan Studies at the University of Oxford. Suu Kyi lived abroad in England for most of her adult life, where she and Aris raised two boys, until returning to her native country in 1988 to tend to her sick mother. Once there, she is approached by locals to lead efforts to form a new government that will bring democracy to the country, ending the iron-handed rule and human rights abuses of the leaders in power. This is one area of the film where the exposition felt clumsily handled; it’s jarring and confusing when Suu Kyi rapidly goes from seemingly being a simple Oxford housewife to the high profile leader of a politically chaotic country. 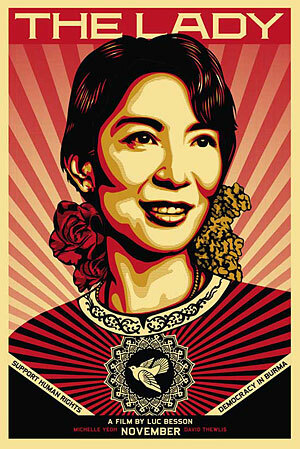 No background is given on her adult years before her return to Burma (was she politically active while in England?) and there’s no real probing into her motivations or qualifications for taking on such a weighty and dangerous position, other than the fact that her father aspired to be a figure of change in the country before he was killed by opposing military forces when Suu Kyi was a child. That was obviously a factor, but a deeper exploration of this critical point in Suu Kyi’s life is needed, especially when we see the massive sacrifices she makes for her beliefs (she misses years of her family’s lives and is unable to be with her husband as he fights and ultimately succumbs to cancer in 1999). Thewlis gives an excellent performance as Aris, who devotedly shared in his wife’s struggle and unremittingly fought for her freedom. Yeoh delivers a dignified, compassionate portrait of Suu Kyi, but is handcuffed somewhat by Besson’s and screenwriter Rebecca Frayn’s rather pedestrian summation of her struggle. Despite its lengthy running time (145 minutes), the film feels rushed and fails to resonate quite as deeply as such a remarkable story should. Yeoh met the politician in Burma last December, a month after Suu Kyi was finally freed, and attempted to visit her again in June while on a break from shooting The Lady in Thailand, but was deported and blacklisted by Burmese officials. I’d never heard of Suu Kyi until U2 brought her name to a wider audience with the song “Walk On” and during brief segments about her at every show on their last couple of tours, for which Besson gives the band a couple of shout-outs in his film, however awkward (one of Suu Kyi’s sons wears a shirt from the band and one of their songs plays on the soundtrack). The Lady, although flawed, is a well-intentioned effort that will bring further attention to her extraordinary life and the ongoing fight for human rights in Burma. This entry was posted in Film Festivals, TIFF and tagged #tiff11, biopic, Burma, humanrights, politics. Bookmark the permalink.